Melanie and i took a walking tour of SMA with Betty and it was fantastic. Betty was really easy to be with and very knowledgeable. She went at a pace that suited us,and we gained a sense of the town from her ,that we used throughout the rest of our trip. i cannot recommend her highly enough,and when we return to SMA, we will look her up and do another tour with her. kenny macpherson. Betty was a great guide...interesting and informative. We enjoyed being with her on this tour and recommend her highly! Betty took the four of us to, around, and into many out of the way places that don't appear on most tourist maps/guides. it was especially useful that she was bilingually fluent to get us started on our month long adventure. Additionally, she has remained available for the occasional question for which we needed in-country insight. We will be touring with her again before we depart. Thank you Betty! 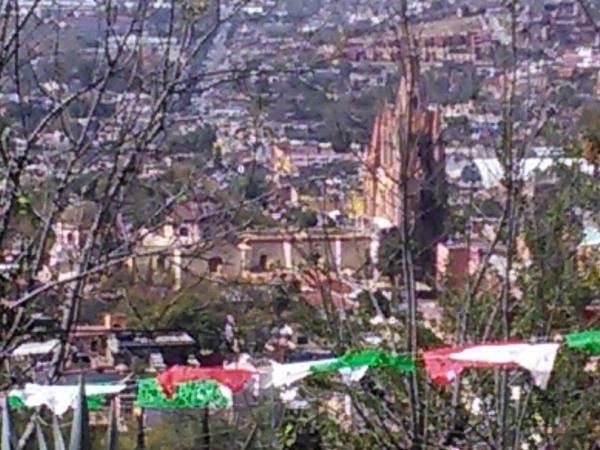 We wanted an insider overview of San Miguel on our first day, and that's exactly what Betty shared with us. She is engaging, knowledgeable and energetic. Her own story informs the tour; at the end of 3 hours we felt as if we had been guided by an old friend. Betty customized our tour to our interests & activity level. She brought us places we would not have found on our own. We enjoyed her company & knowledge of the area. She even got us a box to ship home a beautiful star we bought. Betty set up a custom tour for us to see the neighborhoods of San Miguel and she did a great job of introducing us to SMA! She is very easy going, helpful and knowledgeable. Thanks Betty, for the great tour! Betty spent her childhood in San Miguel. She is the daughter of artist who printed in San Miguel giving her a firsthand knowledge of the art community. We had two wonderful days which we specifically planned with Betty. We bought wonderful art and got a great understanding of this historical town. Betty was a fantastic tour guide in San Miguel! She has lived in the area long time and clearly knows and loves it well. We bumped into people who knew her and wanted to say hello around almost every corner. Betty showed us places we probably wouldn't have noticed like art spaces, tucked away parks, and hidden local shops. I was running low on pesos and she even bought me an ice cream! This tour was a fun away to explore the city and Betty would be fun to hang out with in any town. Highly recommended. The moment Betty met us at our rented home in Centro - I knew we were in good hands. She weaved us through beautiful buildings we would never have thought to peak in...... told us the stories, showed us the views..... made everything interesting for us. Her long standing ties to to the city wove in further stories and anecdotes, making the points of interest just plain more interesting! She's a gem - and I would highly recommend her for anyone that wants to get a delightful overview of SMA! Betty was great and let us take the tour at our on pace. She listened to what interested us and took us to those spots. By far the best day that we have had on our trip to SMDA! Betty was an incredible tour guide. So glad that we did this on our first day so that we could get acclimated with the city. Betty was on time, we toured at a pace that was comfortable for us and we saw everything that we wanted to. All in all a day for the books! Just can't say enough good things about Betty and our experience. Be sure and book this tour with her....you won't be disappointed. We thoroughly enjoyed our time touring this beautiful city with Betty. She was fun and informative and took us to some wonderful spots and neighborhoods that we wouldn't have found on our own. We loved our day together!!! TOUR GUIDE RESPONSE: I truly enjoyed our day also. I'm so pleased you had a good time, Thank you for choosing TBL's and me! Thanks to Betty for a great intro tour to SMA. I did not have much time, Betty was nice enough to meet me at the bus station and see me off there as well. During the tour, which was like visiting with an old friend, she showed me the key sites and was very knowledgeable about the city, showed me the key site and took me to a great cafe for a quick coffee and snack. Betty is a great tour guide!!!. My husband and I enjoyed the tour and learned a lot about San Miguel. What a wonderful guide! We felt like we were being guided by a long lost friend. Aside from being quite knowledgeable about the San Miguel area, sights, customs, history, restaurants, shopping, etc, Betty is extremely personable. We thoroughly enjoyed our Introduction to San Miguel. The time went too fast! Betty showed us sites that we never would have found on our own. We highly recommend Betty and we'll certainly continue our exploration with Betty next time in San Miguel. Betty was just wonderful! It was such a special day. She quickly became very familiar with the kind of experience my husband and I were seeking and she tailored what she showed us to our interests. For example, we took a cab to a nearby hacienda where they had stables because I am interested in dressage. We walked through beautiful parks & she knew about the local history and interesting tidbits of local culture. I felt that we were being shown the sites by a personal friend! TOUR GUIDE RESPONSE: Really enjoyed our day and I hope you return soon! Betty did a great job tailoring out tour for us. She made small adjustments as our day progressed to best suit our specific desires to explore the "back streets" of San Miguel. We enjoyed running into her the next day at the farmers market that she directed us to visit. Betty's knowledge of the area & local events was amazing. I had an awesome time with her and would utilize her services again next time I visit SMA.